In January 2003, in addition to the exterior styling, Sam Sorgiovanni Designs accepted the challenge to develop the interior design of the luxury accommodation and living areas. The trimaran platform allows a radical departure from the standard mono-hull yacht layout where passenger cabins are typically located below decks. The 15.4m wide beam offers enormous deck areas, enabling sophisticated layouts unobtainable in a mono-hull of similar size. 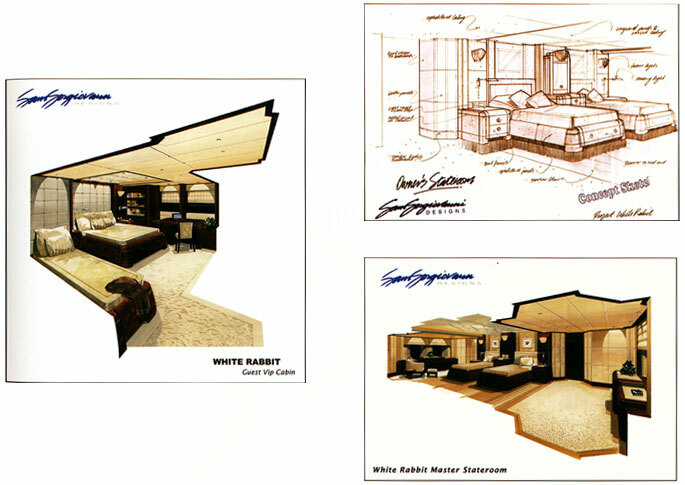 For instance, the guest cabins on White Rabbit are located on the upper deck and thus provide spectacular views.Entered via an automatic sliding door, the main saloon on main deck is dedicated to guest enjoyment. A large lounge area is to starboard, and a dining room and informal lounge to port. These areas are separated by a large stair leading to the upper deck. The oval dining table has seating for up to16, but can be separated into two circular tables for more intimate eight seat dining. A passenger lift services all the topside decks and the fully equipped bar is conveniently located amidships to serve the entertainment area. A formal entry lobby is located forward of the saloon to port. This also provides access to the spacious galley with its own walk-in dry store, cool room and freezer. The owner of White Rabbit enjoys cooking and the expansive gallery is beautifully finished in dark timbers and stainless steel. A large crew mess is forward of the gallery on the port side, featuring lounge seating, another large dining table for ten (again split to two smaller tables when required), A kitchenette area and study. The starboard side and area forward is dedicated to the truly impressive owner’s suite. Covering more than 110m2, the owner’s suite is accessed via a library and study area. The full beam is utilized fro two queen size beds, a small lounge to port, a writing desk to starboard, walk in rode, sauna, private gymnasium and en suite featuring twin vanities, WC, shower and full size marble spa bath. 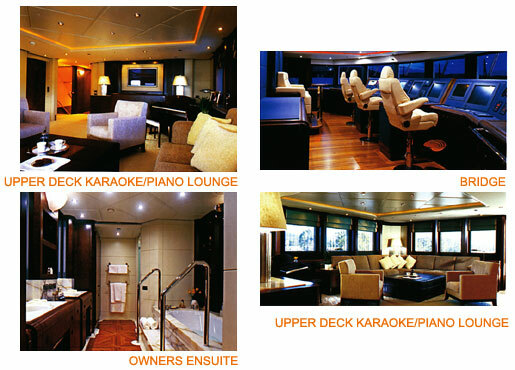 The upper deck houses the guest accommodations spaces and a large karaoke lounge. Five guest rooms are located on this level. Two with king size beds while the remaining Three each have king size beds, a single bed and a concealed Pullman bunk-style bed. All guest rooms have their own en suites. A captain’s cabin, first mate cabin and a hostess crew cabin for four are located forward of the guest spaces. Again all of these cabins have their own en suite attached. The wheelhouse completes this deck. An external walk around deck leads to the foredeck past yet another intimate seating lounge forward of the wheelhouse. 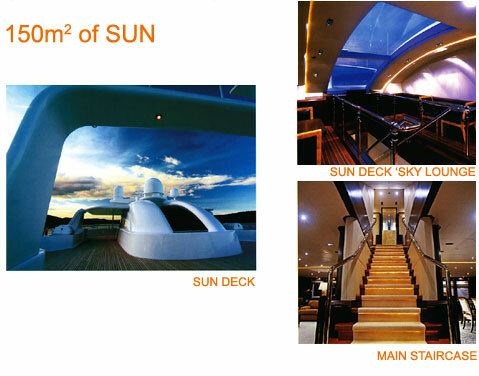 The fly deck offers 150m2 of sun and entertainment. The passenger lift and the main staircase both terminate here and the internal space has been used to create a tranquil and intimate sky lounge. An immense glazed panel sweeps overhead, providing natural light and a splendid view of the towering mast overhead. “In technical terms, the layout design of the interior presented many different challenges that differ from a mono-hull in a number of specific ways. For example; the hulls have considerable less volume when compared to a conventional mono-hull but obviously both the main and upper decks were substantially larger, especially with respect to the beam which is similar to a mono-hulled vessel many times its length. In addition, many of the physical requirements, such as engine room ventilation, due to the engine room being located in the centre hull, created a non conventional set of problems. The result was a layout that has the crew’s accommodation predominantly inside the centre hull with the crew lounge and mess on main deck. The owner’s stateroom and Guest cabins are all on or above main deck. 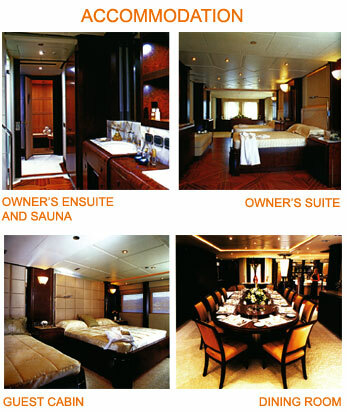 The owner’s suit is situated forward on the main deck. This full beam stateroom is enormous and takes advantage of the privacy due to its full beam layout and is also in the best location, away from technical noise. The Guest cabins are on the upper deck with all rooms enjoyed a wonderful vista out of large windows, a feature not commonly possible from cabins located in a traditional vessel’s hull.